We provide free estimates on roofing services, so you have nothing to lose by giving us a call today for all your roofing needs in Angus. 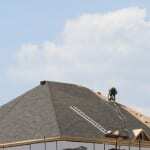 Here at Slippery Slope Roofing, we have an interesting goal – to show you that not all roofers are alike. If you have had a less-than-satisfactory experience in the past, we welcome you to see what makes us different. We go above and beyond to make sure that by the time we have finished your roofing project at your Angus, Ontario property, you have nothing but good things to say about roofers. One of the key ways we accomplish that is by working on only one roof at a time. We believe this is the best way to get your roofing project done quickly and correctly. Dividing a crew across multiple projects doesn’t give you the personal attention we believe you deserve. By having every roofer at your property, we’re able to do detailed work and keep the work site clean as we go. Between our owner and foreman, we have 50 years of combined experience as roofers, so you are assured that the results will be everything you hope it could be. From your first phone call to our complete inspection after we’re completed, you will find us professional and ready to provide solutions that make sense for your particular roofing situation. If you have any questions about roofers, the products we use, our 10-year warranty on our workmanship, or anything else, please feel free to contact us. We provide free estimates on roofing services, so you have nothing to lose by giving us a call today for all your roofing needs. At Slippery Slope Roofing, our roofers proudly serve Barrie, Orillia, Bradford, Alliston, Newmarket, Midhurst, Cookstown, Beeton, Innisfil, Angus, Collingwood, Wasaga Beach, Oro-Medonte, Midland, New Tecumseth, Clearview, Bradford, Essa, Stayner, Springwater, and surrounding areas of Ontario.